Master 22030 Adjustable Keyboard Drawer - Spacious drawer accommodates both keyboard and mouse pad. Use with ergonomic, split and raised-front keyboards. 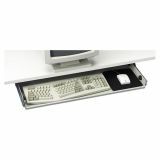 Drawer extends 10" and locks into keying position. Smooth-glide ball-bearing slides for easy drawer pullout. Includes mouse pad. Mousing surface can be used to the left or right of the keyboard. Wrist rest has antibacterial protection. Keyboard manager features an 11" track and is made of heavy-gauge, static-dissipating steel construction. Works in standard workstations.